From simple tenant farmhouses to romantic storybook cottages to architect-designed fantasies, gatehouses are a defining element of the Hudson River Historic District. Marking the entrances to a number of grand estates that form the core of the district, they give the passerby a tantalizing clue as to what lies out of sight down the long tree-lined drives they guard. To follow are some examples that can be found driving along River and Woods Roads in northern Dutchess and southern Columbia Counties. 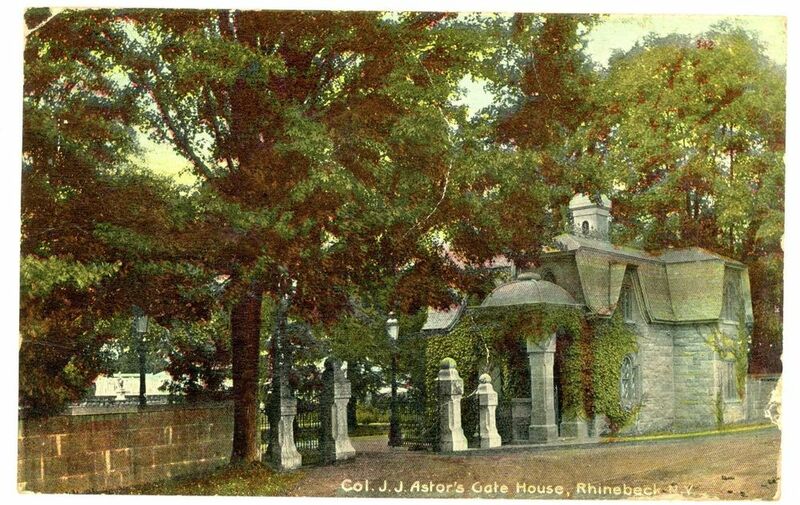 Leave it to the Astor family to have not one but two gatehouses within eyesight of each other at their former country seat a little north of Rhinecliff. The southerly one is a pale yellow brick r 1 ½ story building with arched windows. It originally marked the estate’s farm entrance but was later used as its principal entrance after Vincent Astor made the former playhouse his primary residence in the mid-twentieth century. The second gatehouse designed by Louis Augustus Ehlers around 1860, is a far more fanciful affair. The brick and rough-cut ashlar stone building sporting a polychromed slate roof and diamond-paned windows sits at the entrance leading to Ferncliff’s large Italiante mansion (no longer extant). Currently a private residence, it has been enlarged by later owners who have maintained the overall integrity of the original structure. Unfortunately, a stone portal over the gates pedestrian entrance no longer stands. While Atalanta’s main house (originally named Steen Valletje, then Mandara) has been altered almost beyond recognition, its elaborate entrance gates and two-story rusticated Italianate gatehouse look fairly similar to when they were constructed sometime between 1874 and 1882. Designed by the New York architectural firm of Walter Schickles & co, the gatehouse features hipped roofs, a large stone porch with arched openings, and a bow window on the first floor. This charming stucco gatehouse built around 1840 marks the entrance to Rokeby, one of the last of the Livingston estates to remain in the family with its acreage intact. Taking a slight detour off of River Road onto Station Hill road in Barrytown leads one to a pair of gatehouses designed by AJ Davis for Edgewater. Built for Robert Donaldson in 1854, the two gatehouses were originally designed to anticipate but not compete with the architectural experience one approaching the main house. Both featured octagonal fronts executed in intentionally different styles. The southerly one in a restrained Etruscan style, while the northerly one in an “oriental style”. Though both have been added to to over the years and are now hemmed in by later structures along the road, with a little imagination it is easy envision the striking first impression they once made on visitors to the estate. The gatehouses at Edgewater were not the first designed by AJ Davis for Robert Donaldson. In 1841 Donaldson had him design one for the entrance to Blithewood, nearby in Annandale, which he owned prior to buying Edgewater. The hexagonal white stucco building replaced the function of an even earlier one designed by Davis in 1836 in his textbook carpenter gothic style that was closer to the main house. Today the building is part of the Bard College campus. Designed in 1915 by Francis Hoppin Koen for Louis Gordon Hammersley. With its hexagonal castellated towers, arched entry and iron gates, this neo-Jacobean gatehouse is perhaps the most formal and elaborate found in this section of the Hudson Valley. Later it became known as Ward Manor, and today it is also part of the Bard College Campus. Beginning in Tivoli and ending near Germantown, a number of estates line the west side of Woods Road. Many are adjacent to one another and were once connected by an internal system of carriage roads. Their gatehouses are often set discretely back from the main road and a little harder to spot than those on River Road. A little to the southwest of the Tivoli terminus of Woods Road is Callendar House. While the history of the mansion dates back to 1794, the estates Italiante gatehouse most likely dates from the period of Johnston Livingston’s ownership in 1860. This simple, boxy gatehouse with carpenter gothic board and batten detailing marks the original entrance to Rose Hill, a large Tuscan villa built for General John De Peyster in 1843. This buff brick gatehouse was built around 1870 to complement the large second empire style mansion on the estate built for Valentine Hall of New York City. The estate is best known as where Eleanor Roosevelt spent some of her unhappy childhood years (the Halls were her maternal grandparents). While later additions have nearly doubled its size, they are sympathetic with the original western portion of the structure. The gatehouse to Holcroft most likely predates the present Colonial revival main house on the property (the earlier main house was destroyed by fire). Similar to Rose Hill, it features vertical board and batten siding but gets a little more creative with the Swiss Chalet-style influence in its roofline. Built around 1875 (some twenty years later than the main mansion) at Northwood, this storybook gambrel roofed cottage marking its entrance hearkens back to a romantic version of the estates colonial past, when it was part of Livingston Manor. Jan 6 Alva's Collection: Buildings associated with the woman who "loved being knee-deep in mortar"